Employee turnover is a big concern for many businesses. The investment and the cost to replace talent can often be overwhelming. So what can you do to reduce this turn over and keep your most talented people? Employees are an investment. From the second they join your company the costs start accruing. Everything from the interview onwards, such as training, is carried out under the presumption the time spent will ultimately generate value for your business. When your company has a high turnover of employees the repetition of this process, plus the cost of recruiting a replacement, costs your company. In fact, it’s estimated every lost employee costs a company an average of 38% of the person’s wages. 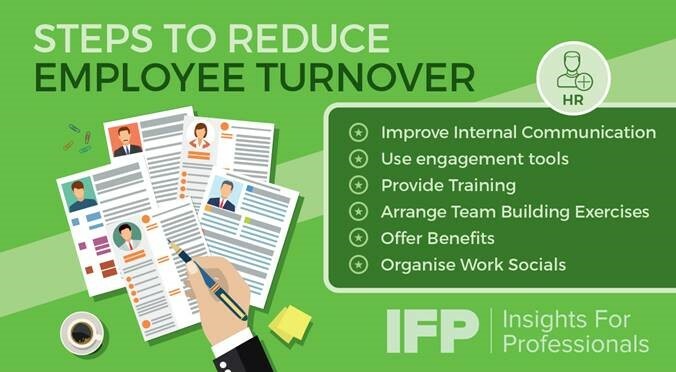 Why is reducing employee turnover important? The long-term implications of turnover don’t just affect the company’s bottom line, but it can also reduce the level of experience, which leads to decreased productivity and a reduction in quality, ultimately having a negative impact on the reputation of your company. While you’re finding a replacement and getting them up to speed, other employees can become overworked, and the potential to have to pay overtime increases. However, while companies cannot prevent employees from getting their heads turned by perceived greener pastures, there are steps we can take to ensure our employees remain happy, motivated, and engaged. Many of the benefits are a direct reflection of the negatives mentioned above, but some are less obvious. Retaining your workforce helps to maintain at least the same quality standards, reduces the need for training, and creates a more comfortable work environment, as employees are more familiar with each other. It also negates all the expenses associated with the recruitment and training of a new team member. How is the employee turnover rate calculated? In order to understand the potential impact of employee turnover on your company it’s important to have an accurate starting point. In order to achieve this you will need your employment figures for the last 12 months. Some companies will differentiate between the varying reasons for employee turnover, such as whether an employee has been fired, left voluntarily, or even had a very compelling underlying reason not related to the company. It’s calculated by dividing the total number of employees that have left by your average number of employees for the same period, and then multiplying the answer by 100. To calculate the average number of employees you need to know how many there were at the start of the period, and at the end of the period. You add these figures together and divide by two, e.g. 502 divided by 2 equals 251. Therefore, 251 is the average number of employees for this period. The total number of employees that left your firm for the same period is 39. We then divide this number by the average number of employees, which gives us 0.155. We then multiply this figure by 100, which equals 15.5. This is the percentage of your employee turnover, so in this example 39 employees leaving generates an employee turnover of 15.5% of the total workforce. There are staff retention strategies to help prevent employees looking elsewhere, which reduces the cost of employee turnover. Some sound like common sense, which can often be the root cause of some of the problems. Problems such as poor internal communication and not recognizing employee achievements can seem like such obvious issues, leadership can often presume it’s being dealt with. A one-sided relationship where employers just give out instructions is not healthy. An employee must feel like they have a genuine channel of communication where their voice is heard. You can use engagement tools to keep your employees talking to you. These can include a satisfaction survey administered by a third party, clearly defined training opportunities and/or committee creation for certain aspects of your firm. You can even ask for feedback and opinions on a relevant matter to help reinforce the channel of communication, and establish their position as an active participant. Anything that adds value to an individual’s experience as an employee will help reduce employee turnover. Even the smallest gestures and rewards help to improve the work environment. Not all staff retention strategies will be right for your company, but you can select the ones you think are the best fit, then when an appropriate amount of time has passed you can recalculate your percentage again and quickly discover if the cost of employee turnover has decreased or increased. Even hand written thank you notes can be effective. How does training help to improve employee turnover? When you provide employees with training, you’re sending the message you care. You want to see them progress as an individual and you want the company to keep moving in the right direction. Depending on the sector and type of business your company is involved in, the specifics of the training will vary. Some training is general and short, while more intense longer-term training might also be an option. If the cost of training is high, then some employers will only cover the cost if the employee agrees to a minimum employment period. This ensures they get a return on their investment. If the employee leaves before the guaranteed period of employment has passed, they must reimburse the employer the cost of the training. Sometimes, no matter how happy they are in their current position, some people just want to change. Also, there will always be the occasional employee you’re not very upset about losing, as it gives you a chance to replace them with someone who will add more value to your business. If your talented individuals are getting itchy feet, then it can be a good idea to consider moving them within your organization. This can help you to retain the most talented individuals, while helping to quench their desire for a change of scenery. Whether it’s due to movement within your firm, or even the occasional new addition, a small amount of employee turnover helps to keep the work environment fresh and prevent complacency. Although, there is no established ideal level of employee turnover, your company’s bottom line is usually a good indicator. Understanding the most common reasons why employees leave will help you to identify the best retention strategies for your business. The aim is to create a happy, motivated, and engaged workforce where good communication and trust is central. This will make your company more productive and improve the likelihood of your employees remaining loyal in the future.